Eating in Madison A to Z: Rama Food Tour: "Eat Like a Badger"
Rama Food Tour: "Eat Like a Badger"
If you're like us at all, you like to live vicariously through travel and food writing. When you get to travel, your itinerary centers on meals - or you might even pick destinations just for the food. If this is you, and you have an iPhone or iPad, may we recommend the Rama Food app? It's a free app with free and low-cost, food-centric walking tours of 22+ cities in the US and around the globe. A branch of the acclaimed Rama (one of Lonely Planet/BBC Travel's "best new travel apps" of 2010), Rama Food launched on April 6, 2012 and will be adding more tours in the weeks to come. We're thrilled to be included in this company. 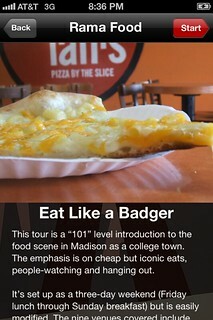 Our Madison tour, called "Eat Like a Badger," highlights nine Madison locales that define the campus-centric experience. We'd recommend it for people new to Madison, prospective students & alumni of the UW, and fans of the odd bit of food history trivia. We drew on our blogging experience to choose some of the most Madisonny places we could think of, but all the words and most of the photos are brand-new. Corrections and feedback are very welcome, as are suggestions for future tours you'd like to see - feel free to comment below or contact us. You can also make suggestions for tours directly to Rama, or head to Twitter and follow Rama Food and the Rama Food authors. Happy eating! That looks like a great app. I wish it was available for the Android. The Android version is in development - we'll post again when it's ready, or you can get updated as soon as it's out by following @Rama_Food or facebook.com/RamaApp.